The path towards change will start locally, but it will connect regionally. Growth starts from the ground up. Our sustenance begins with the soil, the air, the water, and the elements. From these, we taste how quality food can revolutionize our world. Farmstead Dairy Animals live a cyclical lifestyle. They survive off of pasture, alfalfa, and greens of all types. The artistry of developing a palate couples with the artistry of developing a piece of land. 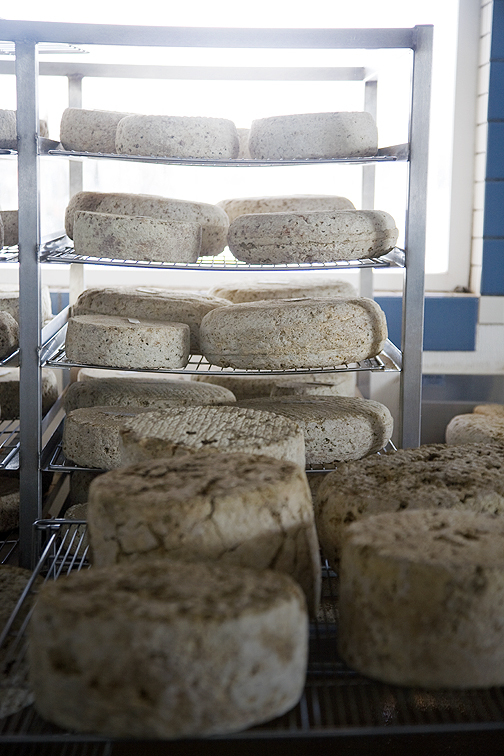 The Monteillet Fromagerie is a French goat and sheep artisanal cheese production with an inherent hands on, underground spirit. It is a resource center for all of the west coast. Gardens, animals, courses, outdoor kitchen, and an artistic vision of a new agricultural economy. Come learn, share, and taste the knowledge of what it takes to make a quality cheese from the ground up. Le Roi Noir, “The Black King”: Soft-ripened, 2/3 goat, 1/3 sheep, Grapeleaf Ash and sea salt on the exterior with a crown of edible gold, flavors of mushrooms, unlike any other cheese! La Fleur du Midi: Fresh round, rolled in smoky and hot paprika with sea salt with a layer of paprika running through the center. Great Mediterranean flavors! Citrusy and smoky! Causse Noir: Hard cheese tomme, aged 3 months, 2/3 goat, 1/3 sheep milk. Flavors of nuts, butterscotch, caramel, oranges and lemons. Great with all wines! wine, spices, and warmth, yum! hand-rolled cognac truffles, salted caramel, bittersweet, green tea and jasmine, orange and cardamom, sour cherry almond bark, and caramelized chocolate covered almonds. a photo montage of hands on production from Monteillet Fromagerie, INNA Jam, Foggy Bridge, Zoey Kroll, and more…! Finale DJ Dreamstorm Dance Party starting at 10! Come join us for a night of pairing the rural artisan with the urban artisan. SIGN UP to attend the event. This is an almost free, private event. Members only! Sign up is free. Space is limited, so each individual attending must sign up. When you sign up, you also understand that some of the products have not been made in a commercial kitchen space. Invite all of your friends! Spread the Cheese Love. You can also sign up at the door. Be an Urban Vendor Click here! The vendor fee is $30, and you will provide a tasting with a suggested donation price of $2-$7. Urban farms are beautiful and we want to celebrate the bounty. Be a Photographer Have some great farming production photo series? Want to photograph the event? We want you! Be a Musician Let’s move and groove all night long. Be a Volunteer How fun to be a part of a revolutionary night! Previous post ← San Francisco’s First Homestead Cheese & Pairings Soiree!